Holiday Traditions | are you my moms? Another daily ritual: we let our sweet dog, Stella, into the bed in the morning for some cuddle time. Every morning, we let her lay between us and we scratch her belly while she tries to see which one of our faces she can lick more feverishly. We know Caesar Milian would not approve, but we don’t care. We don’t cave about everything she wants – just this. And we do it because we get as much out of that cuddle time as she does. We have holiday traditions, too. Every year for Christmas, we buy each other at least one gift that’s completely stupid, but practical, and it becomes the favorite gift of the year. Examples of these presents include new bathroom towels, an insulated coffee mug, cuticle sticks, gel shoe inserts, etc…you get the idea. It’s not even usually about the gift itself, but about the fact that we know what the other’s daily pain points and annoyances are, and will listen all year-long just for the chance to fix things on December 25th. One of my favorite holiday traditions is coming up this week. Not tomorrow, though I do love everything associated with Thanksgiving…who wouldn’t love a meal built almost entirely on carbs and a table decorated with handprint turkey crafts? 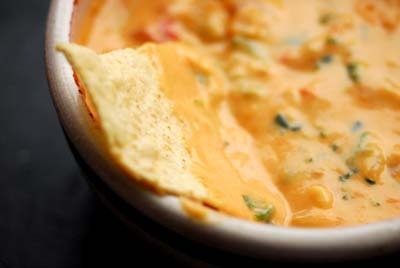 No, the tradition I’m referring to is that which happens on Thanksgiving Eve: the annual Dia de Gracias por el Queso. This oft-ignored holiday celebration allows us all to stop and give thanks for the joys of Mexican food before we’re forced to eat leftover turkey through Sunday, and without the crowds of tequila-filled frat boys one encounters on Cinco de Mayo. Now before you go googling “Dia de Gracias por el Queso,” let me clarify: this is not a national holiday…not here, and not in any Spanish-speaking countries, either. It isn’t going to be found on any bank calendars, nor will it be observed by your employer, so you’d better plan on showing up to work. This very special tradition was started about 6 years ago, when MKL and I met our bff’s for dinner the night before Thanksgiving. Over pomegranate margaritas (lots and lots and lots of them), we realized that Thanksgiving is not all it’s advertised to be. We’re supposed to spend the day being grateful for the people in our lives, showing one another how much we love each other. But don’t most of us usually spend it cleaning, decorating, cooking, arguing about football, and just trying to make it to the pie without incident so that we can get out in the wee hours of Friday morning and become horribly materialistic again? Or worse – driving frantically from family dinner to family dinner so that no one feels left out or “un-thanked?” Right. And that’s why we decided it was time to start a holiday tradition with our chosen family. So each year we return to one of a few Mexican restaurants in our neighborhood and properly give thanks for one another over queso and guacamole. If you’re not part of the LGBTQ community, you might not be familiar with the concept of “chosen family.” In our circles, this term refers to the people who aren’t blood relatives, but who love and care for one another as though they are. Since many of us have been ostracized from the families that raised us, our friends often become our true family. Fortunately, MKL & I and our bff’s all still have solid, (mostly) loving relationships with our biological families. All four of us know that when times are tough, our families will be there for us; I know we’ll all be saying words of thanks for them tomorrow, whether we’re with them or not. But tonight is just for us. Tonight we celebrate a friendship that has carried us all through some of the best and worst times of our lives. We are the kind of friends who are honest with one another about everything, and who can make each other laugh with just a roll of the eye or a joke from the loge. MKL and I are particularly grateful for our bff’s this year, as they have supported us tirelessly through this ttc journey. It has been a long road thus far, and whether I’m pregnant now or not, we have many more miles to go. Tonight, as I’m dipping chips into the holiest of holy queso, I will be grateful. I will be grateful for all our chosen family has done for us – all the long walks and workouts, donor selection feedback, doggy dates, takeout dinners, champagne brunches, pool days and pool hall nights. There’s no one else with whom I’d rather spend the Dia de Gracias por el Queso. I nominated you for an award, stop by and check it out!